In this project we worked with 1621 beneficiaries through creative up-cycling workshops. Lynette’s volunteering on the project provided her with opportunity to improve her CV by gaining experience in community project work and delivering workshops; showing the value of volunteering within the project as this has helped Lynette move towards paid employment. ​ 36364 people saw the art work exhibited at Liverpool central library. Turning The Tables was a highly visual and hands on project that resulted in an installation of a community made artwork piece in Liverpool City Centre. Through a series of workshops, participants learned furniture and textile reuse skills ​whilst simultaneously contributing to our artwork. 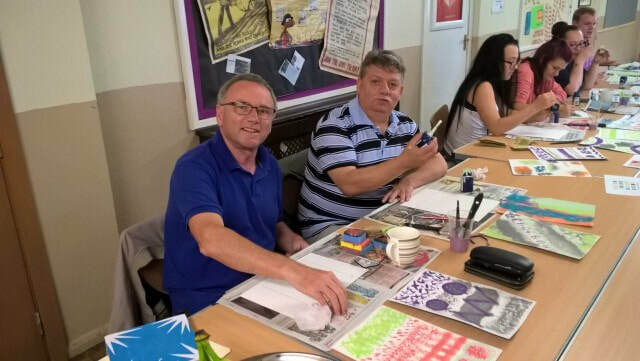 We were been delighted to work with fantastic community Hubs throughout this project who have hosted workshops, delivered their own sessions and shared their skills at Health & Wellbeing events. ​This project was supported by the Merseyside Recycling and Waste Authority (MRWA).